A search of IMDb Movie database in 2007 showed over 190 films have been shot in Melbourne including the world's first feature film The Story of the Kelly Gang filmed in Heidelberg and is generally thought to be the first ever narrative full-length feature film. Other well known films include Mad Max, The Bank, The Castle (our favourite), The Dish, The Man from Snowy River and Phar Lap. This story of a frontman/junkie (played by a young Michael Hutchence) living in a share house in Richmond was flmed in the actual Berry Street terrace where the director once lived (and where many events that inspired the flm happened). 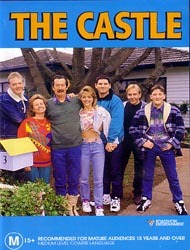 Shot mostly around Strathmore, the most recognisable set location in The Castle is the Supreme Court of Victoria, where lawyer Dennis Denuto argued against the compulsory acquisition of the Kerrigan family home based on 'the vibe' of the constitution. Ultimately more about politics than tactics, The Club was shot entirely on location inside the club rooms and boardrooms of Collingwood Football Club's historic home ground, Victoria Park. A few Magpie players of the time, including Tony Shaw and Rene Kink, even made cameos in the flm as themselves. Set in the inner north, this meditation on love and addiction is remembered by one reviewer for a picture-perfect Fitzroy Pool, 'swimmers sunbaking on candy-coloured towels - an image as bright and brittle as a David Hockney painting' . The city shut down to allow flming everywhere from the Flinders Street clocks to the State Library, and although Ava Gardner never actually called Melbourne 'the perfect place to make a flm about the end of the world' , you could hardly blame her if she had - she also spent weeks flming in Berwick and Frankston. The sterile white walls of H Division (high-security ) at Pentridge Prison were the perfectly ominous backdrop for much of Andrew Dominik's biopic about standover man Mark 'Chopper' Read. Everyone knows we like to link to our sources, but strangely, we were unable to link to this magazine online. A search for 'Top 10 movies in Melbourne' returns TheAge pages that strangely show pictures (no content) of Duck Soup, Singin' in the Rain and Margaret. In 2014, Leader / HeraldSun published its top 10 films shot in Melbourne. The top 10 criteria remains a mystery other than being filmed here in Victoria. OVER the years Melbourne has established her own slice of the Hollywood pie. The city is a favoured film location for several Hollywood and other foreign movies. Here's a look at some of them. If you watch them closely you might recognise some of our landmarks.